I’ve been working my through my Harry Potter reread and rewatch at the pace of an arthritic tortoise. The reread was supposed to get done before the last movie came out, and the rewatch when the boxed set of movies come out on DVD. BAHAHAHA! Anyways, as I watched The Harry Potter and the Chamber of Secrets, I found myself utterly delighted. The acting may have been a little cheesy at time, but the bones of the story and characters I adore are still there. I also kept noticing how young all of the actors are in this film (Daniel Radcliffe’s voice hadn’t changed! ), which made me feel nostalgic for my middle school years when this movie was first released. One of the reasons I love Chamber of Secrets so much is because it’s our chance to get to know the Weasleys better. I absolutely adore how eccentric and busy they are, and I love the way the flying car and the Burrow are portrayed here. I really am dying to live in the burrow—despite the lack of personal space, how awesome would it be to get to know the Weasleys?! I especially love Arthur’s serious yet hilarious to us questions about Muggle life. We also see some more of some of Rowling’s other awesome characters—Hermione really starts coming into her own, and as for McGonagall, all I wrote in my notes when I watched the movie is EFF YEAH MAGGIE SMITH, which is all that really needs to be said when she comes on screen. Plus, we also see the awesomeness of Fawkes. I can see some people saying that this movie is totally overacted. Throughout this movie, I think a lot of the characters have personalities that are naturally over the top (Gildeory Lockhart, Colin Creevy) or just react to situations in ways that feel extra dramatic (Dobby, Petunia, Malfoy). Plus, there’s Ron’s reaction to the Whomping Willow, which is really in a league of its own. You have to remember that while these movies have appeal for everyone, they were probably made with kids and teens in particular in mind. And you also have to remember that actually? The Chamber of Secrets has a really dark storyline. There is blood on the walls and spiders, both of which would make me scream with terror in real life. Plus, Ginny is essentially possessed. SO CREEPY. Rowling’s comedy combined with the acting was a really nice way to make sure that this movie still had lighter moments and was suited towards a younger audience. Overall, I was pretty pleased with the effects here. Special effects in movies are constantly changing, so it’s hard to draw any kind of comparison. Everything felt believable, and I think the tone that the whole team was going for was always achieved. Let’s not talk about how scary Aragog is, mmmkay? That said the effects definitely get stronger as the films continue on. My favorite, and maybe you couldn’t really call it an effect, was Moaning Myrte. Plus the voice acting was so well done that I really believed that Myrtle’s life and ghost were just filled with angst. Another thing I kept noting as I was watching? Hogwarts itself. I loved seeing it and Christmas, in the snow, and just continually seeing new parts of it. And I think that’s why I love the Harry Potter movies as well as the books: they always take me back to one of my favorite fictional places, a place I wish so badly could be real, and give me a compelling story with favorite characters to follow along the way. Plus, it takes me back to the magic of discovering this series in middle school, and reminds me why I plan to push these books and movies on my children, if I ever have any. I love Christmas Hogwarts LOVE IT. 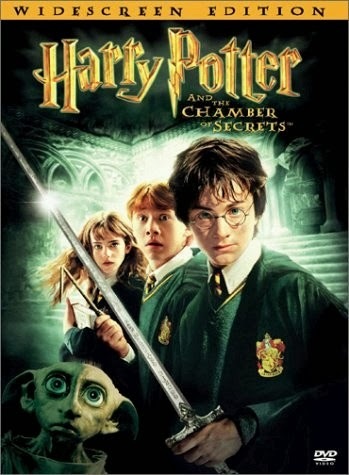 It's been years since I've watched this film, I think I've only seen Chamber of Secrets twice. Love the idea of doing a re-read and a re-watch. I also think it's okay to go at it slowly, life happens, ya know? Also, agreed, Eff yeah Maggie Smith. IN ALL THE THINGS. I agree that all the HP movies are fine adaptions of the books. Of course, the books are better, but that's my personal opinion. I have actually been banned (by my dear husband) from watching film adaptions of books because I tend to annoyed the crap of him by pointing out all the things the movie got wrong. Sigh. RELEASE WEEK Celebration: THE PERFECT DRESS by Carolyn Brown!